I finally have time to sit down and write as I wait for the International Departures gate to open. 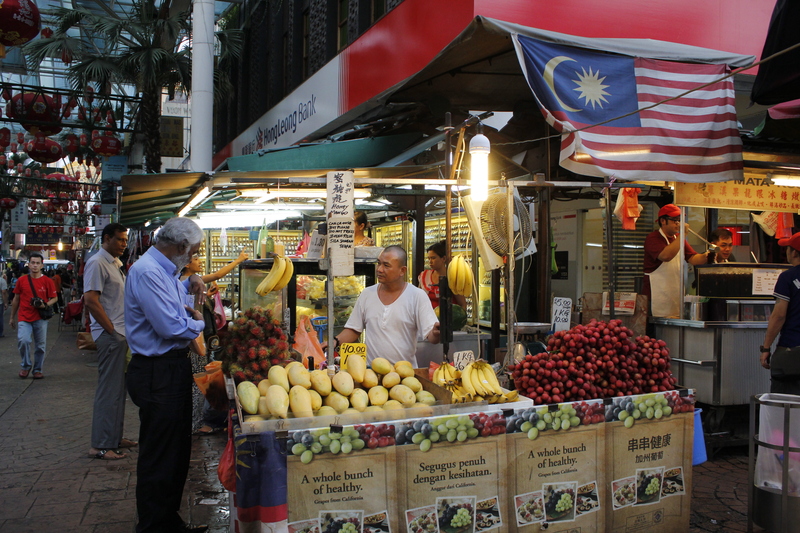 I am now headed to Kuala Lumpur, Malaysia for a couple of days to quickly see the city and re-enter Indonesia. I am in other words on a visa-run, avoiding the immigration office and just exiting the country so I can get another 30 days. I was planning to see Kuala Lumpur anyway so this works out well. 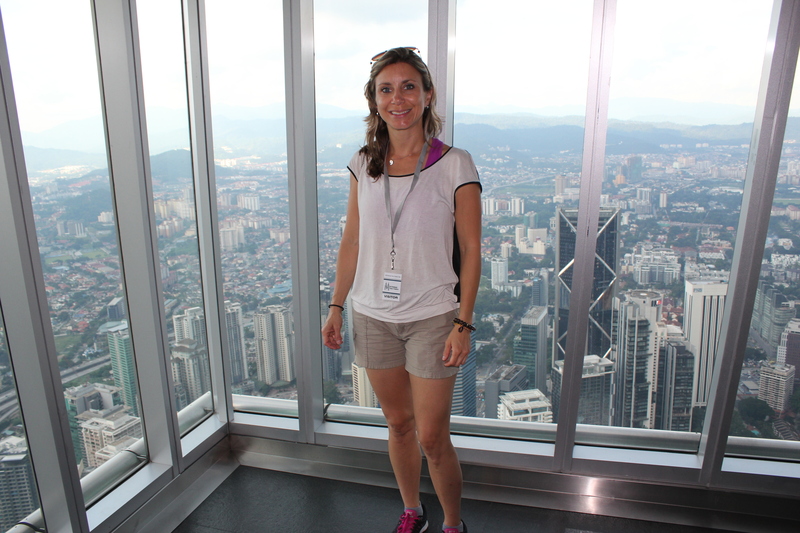 I will however be back to Malaysia later in July to see more of the country. 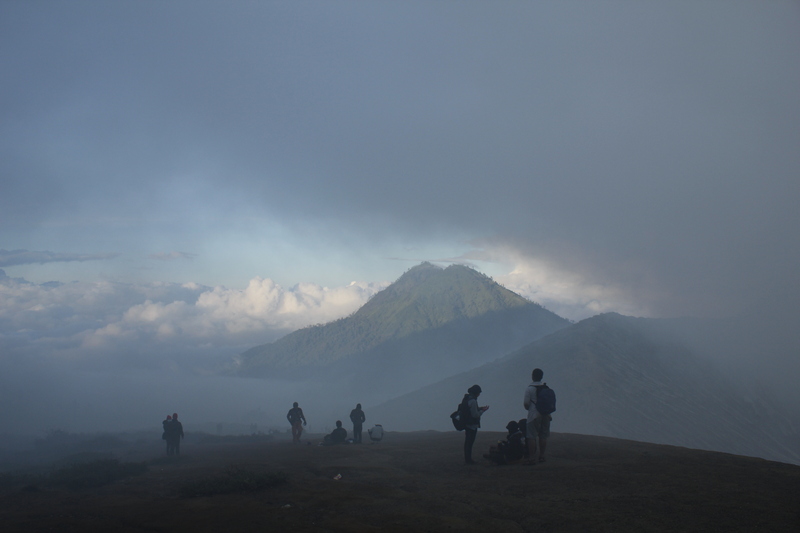 So… back to Indonesia… this place is so awesome, I just can’t get enough of it. I just don’t feel like I can leave “complete” without experiencing its amazing jungles and wildlife. 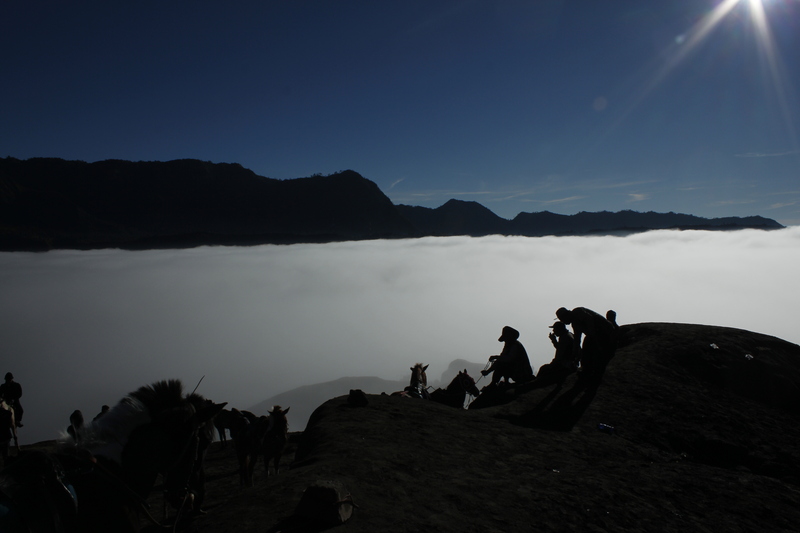 I really want to go to Borneo but it has been difficult to find other people that want to do any trekking there. I have learned that the wildlife in Borneo cannot be found anywhere else in the world. They have pigmy elephants, pigmy rhinos and long-nose (proboscis) monkeys, among other species. So luckily, I met a nice Colombian guy that also wants to check out the jungles and wildlife but he does not want to go to Borneo, instead he offered to join him in Sumatra, Indonesia. I had not thought much about going to Sumatra since I read and hear that it is a very strict muslim part of Indonesia and traveling as a solo female there may not be easy. But since I now have company, I am happy to report that I will be heading there next. The plan is to meet in Medan, the largest city in Sumatra. In two days I will fly from Kuala Lumpur to Medan and meet my friend Alejandro. We plan to begin our trip in Bukit Lawang and stay in the region for as long as it takes to get a good jungle experience and good knowledge of the area. And just yesterday (after writing this), I met a nice Russian couple that lives in Bali and runs a tour company for Russian tourists. They will be exploring Borneo at the end of the month and invited me to come along. Let’s see how much jungle I can handle. I have yet to see the Komodo Dragons so if I decide that Borneo is too much after Sumatra, then I will head over to the island of Flores and Komodo to see the infamous dragons… oh so much to do!!! Anyway… now I want to summarize the highlights of the wonderful island of Java, that just like Bali, left me mesmerized by its beauty and wanting to see more. I arrived in Yogyakarta a week ago, a major tourist hub in the island of Java where you can find lots of options for accommodations, tons of street shopping, sort of like giant flea markets with tons of street eateries and of course many possibilities to join other travelers to visit the important Hindu and Buddhist landmarks and more spectacular volcanoes. When I arrived to my hotel I was so tired I just wanted to take a nap so I did. When I woke up, I was so out of it and tired that I did not want to venture out on my own to deal with a big unknown city. But how could I miss out? time is precious and limited so I made myself get up and get on the road. I decided to hire a guy with a bekac or bicycle rickshaw to take me to an important and historical part of town and see all there is to see along the way. I probably lost another 10 years of life-span after inhaling all the smog emitted by the crazy amounts of motor bikes and cars that fill the streets. I tried to go see the Sultan’s palace but it had just closed so I asked the man to take me to the busiest part of the city, the overwhelming Malioboro street. He dropped me off at the end and I started making my way back to the beginning of it by foot, passing a million vendors along the way offering Rp 15,000 (US$1) t-shirts among many other types of souvenirs and knick-knacks. I was famished by this point so I tried to find a nice warung (local cafe) to have lunch but could not see anything other than McDonalds and KFC… I finally walked by some street eateries selling fried rice with chicken and the business owner invited me to sit down and eat with him… so I did. He was very nice and interested to find out where I was from. I always proudly tell everyone that I was born and raised in Colombia but have lived in the US for most of my life. They usually want to know what city in the US but this particular man wanted to know all about Colombia and practice his Spanish with me. He was a very nice man, however, when I finished my meal, he tried to steer me in the direction of his friend’s Batik shop; which the Lonely Planet warns you about… everyone wants to sell you their Batiks and get as much money as they can out of you. But I said no thanks and had to pretty much run out of there as he kept insisting and walking after me. I stopped at the local mall to see what malls in Indonesia are like. They are pretty much the same as the ones we have in the US with the exception of having a ton of vendors in the middle of the mall selling the same t-shirts, souvenirs and jewelry that you can find outside on the streets but at higher prices. I had a nice fancy ice cream/coffee drink and people watched for a while before returning to the street madness. I caught another becak to drop me off in the hostel area where all the backpackers stay to find out about groups that I could join to do things in the region, like the volcanoes and such. I was overwhelmed with all of the options and quotes that I was receiving but quickly found out that the prices are pretty much the same everywhere so I decided to book directly from my hotel. The next day I had to get up at 3:30 am to go to Borubudur with a tour group. 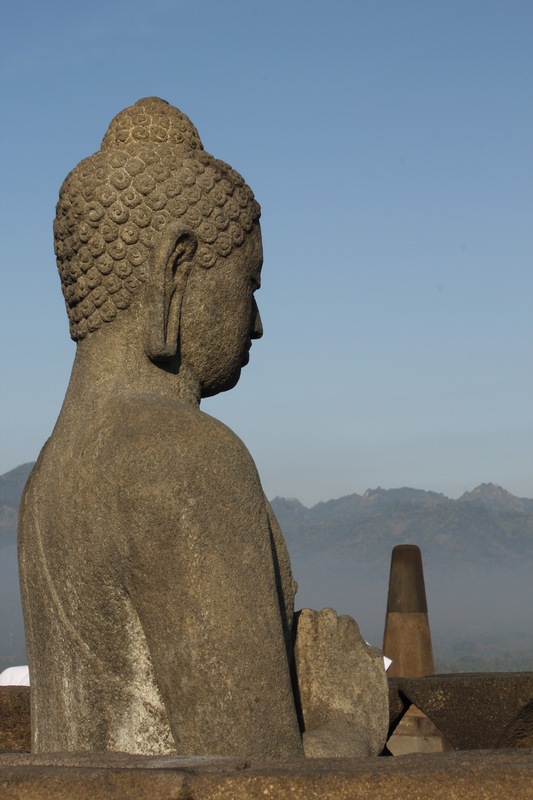 The idea was to get there before sunrise so we could watch Borobudur from a hill called Punthuk Setumbu. 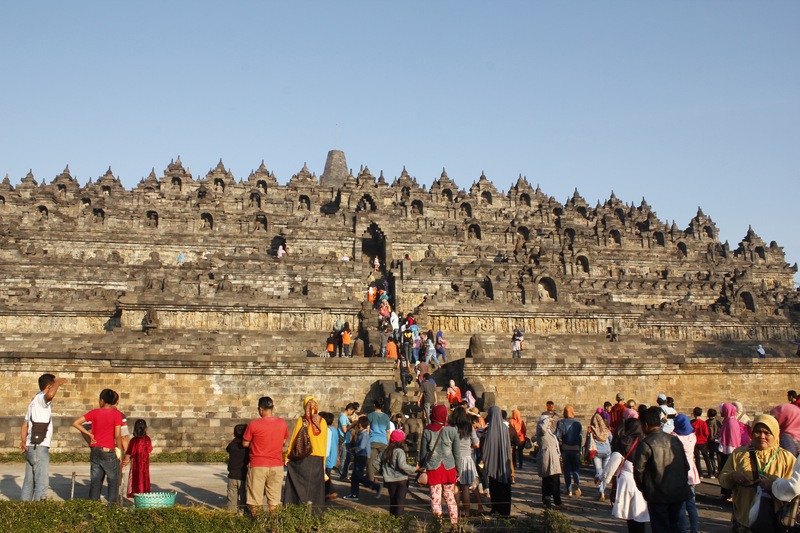 Borobudur is a giant and spectacular Buddhist monument built between AD 750 and AD 850 and a Unesco World Heritage site. Literally tons of stones were transported here to be shaped into hundreds of stupas and buddhas. 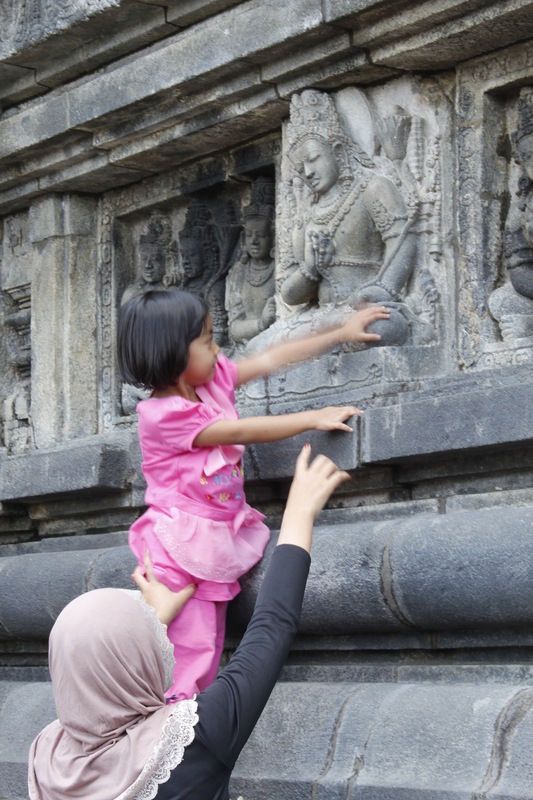 On the stones you can see decorated panels; which narrate Buddhist doctrines as well as details of the Javanese life of the time. 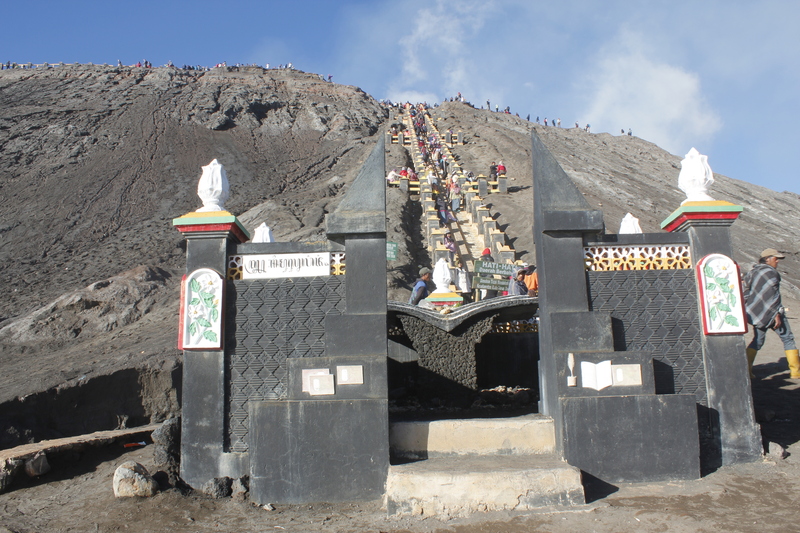 This colossal monument has survived the near by volcano Merapi’s eruptions, earthquakes and terrorist attacks. This place is truly magical, the only downside was that we went on a Saturday; which is when different schools from nearby villages go to the monument. There were hundreds of children who had never seen foreigners so they would stop us every 2 minutes (not exaggerating) to ask to take photos with us. It was cute at the beginning but after the 5th group you start to get really annoyed. But we still complied to every request. I took some photos of them as well. Besides experiencing this fabulous place, I also had the pleasure of meeting very nice people from different countries. This is my favorite part of traveling, the locals of course and the world travelers. A girl from New Caledonia (first time ever! ), a girl from Holland, a girl from the Czech Republic (whom I keep running into at every place I go to in Java, no matter how far it is, so I think we are destined to be friends), and a happy mom traveling with her husband and 8-month old baby (who was on the tour by herself since the baby needed to get some sleep) and a guy from Japan who is also on a long-term trip around Asia. I invited him to have lunch with me when we got back to Yogyakarta that day. I am sure I will be meeting him in Japan next year when I am there. Super nice guy! 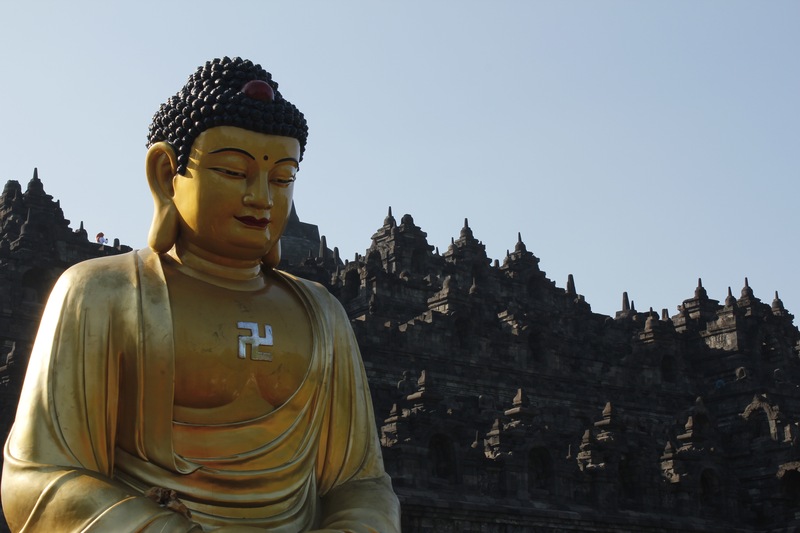 Borobudur was followed by a visit to the spectacular Hindu temple of Prambanan; which was built in the 9th century AD during Java’s period of Hindu culture. This place is a complex of various temple structures, each dedicated to a different God such as Shiva and Shiva’s son, Ganesha among others… This is also a Unesco World Heritage site and so far one of my favorite temples. It is simply majestic! A quick sidetone, I have not slept very much since I came to Java. Besides having to get up in the wee hours of the morning for every volcano sunrise hike, there is a very confused rooster by my hotel that likes to begin announcing the sunrise as early as 1:00 am. Then there is the call to pray at 4:30 am and it feels like the Imam has placed a speaker right inside my room. My schedule is still out of whack, even after almost a month here! I get up at 1:00, 2:00 or 3:00 am for the hikes (or to hear the rooster and Imam), sometimes, I try to nap in the late afternoons (when I can) and I shower late at night before bed. So to maintain my crazy schedule I decided to book another group outing for the following 3 days to go visit some popular volcanoes on the island. 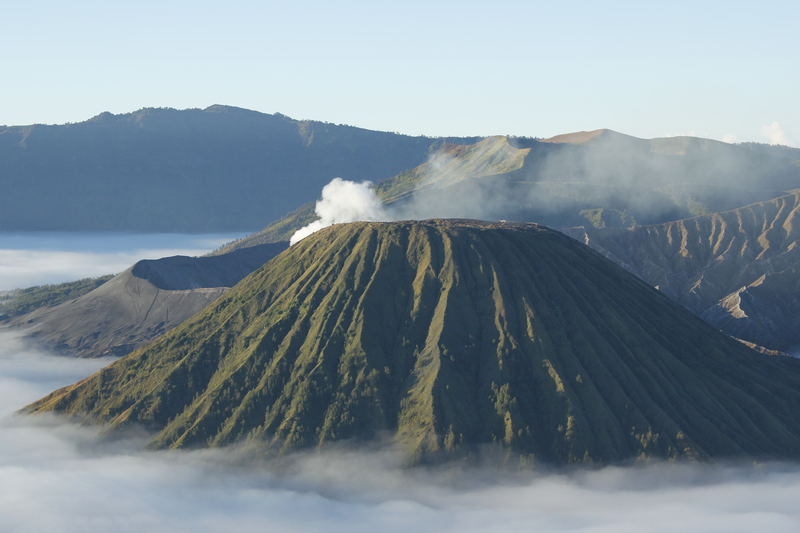 The first volcano Bromo was near the city of Probolingo. I decided to experience train travel in Java by taking a 10-hour train ride there. Even if more expensive, I thought it would be more fun than taking a mini bus. I was the only foreigner on my economy coach so of course I stood out like a sore thumb; which made it an even more interesting experience. People stared at me, a girl asked to take a picture with me, I was offered food various times, etc. It was fun! The majority of the population is muslim so practically all women on the train were wearing their hijab and I always wonder how they can survive the crazy heat and humidity here in these. A lot of people were wearing masks to protect themselves against the pollution (so they explained). The masks usually have different motives, I even saw a Hello Kitty one. A couple of train employees come by every hour or so offering nasi goreng (fired rice with egg and salad), chips, wafers and drinks. The fried rice cost only $1.36. I was very impressed with the cleanliness of the train and the organization. There is a guy that comes by every so often to sweep under the seats and pick up all of the food packaging. I understand these trains used to be hot chaotic messes but now they have AC and assigned seating. At one point the train stopped for a while for no apparent reason. Some thought it was a breakdown but we never heard the real reason. I am making it sound very pretty but it really isn’t the most comfortable method of transportation. We were six people sitting on two benches facing each other with our knees almost touching for 10 hours. It is difficult to extend your legs at the beginning. Everyone sticks to their assigned space and respects each others’ boundaries, but a few hours later, people are taking shoes off, putting their feet up and extending legs right between yours. It actually works out nicely, everyone finds a way to make it through the journey. I had some nice neighbors in my seating area- young University students of different subjects: Writing, Linguistics, Public Health and Medicine. They all invited me to join them in Bromo (the volcano) and one of them invited me to visit his hometown Pandung but unfortunately I didn’t have time to go. That night I stayed in a simple homestay in a village an hour away from Probolingo (where I got off the train), with no sink and a squatting toilet (these are everywhere but it was the first time I had one in my hostel room). 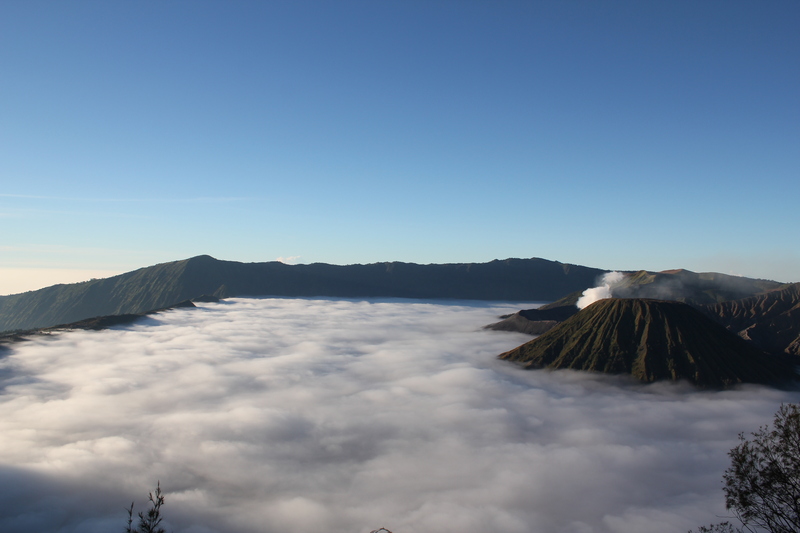 I had a few nice hours of sleep before waking up at 1:00 am to go to see the sunrise over the volcano Bromo. 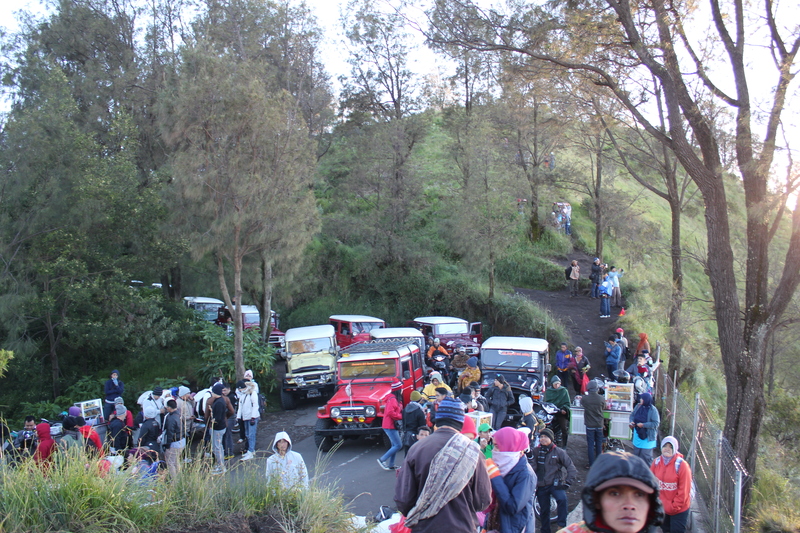 Everyone rides in jeeps to the viewpoint and our driver for some reason, wanted to win the jeep race up the mountain. It was a scary and fun ride. I met a few girls from Germany and one of them had been traveling solo around the world for 10 months. She told me that she had had no problems in India as a solo female and that she really enjoyed it. This makes me feel better about going there as this one of those places that sound very exciting but intimidating to me. 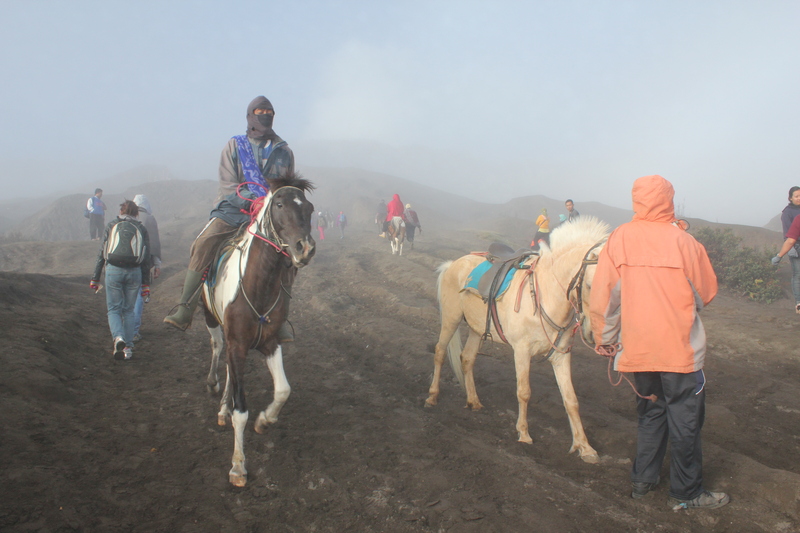 After watching the sunrise, everyone gets back in the jeeps to ride down to the volcano where we went up a long staircase to get to the crater and walk around the rim. This is by far the most spectacular volcano I have ever seen in my life. These pictures don’t give it justice but trust me, it was pretty amazing. 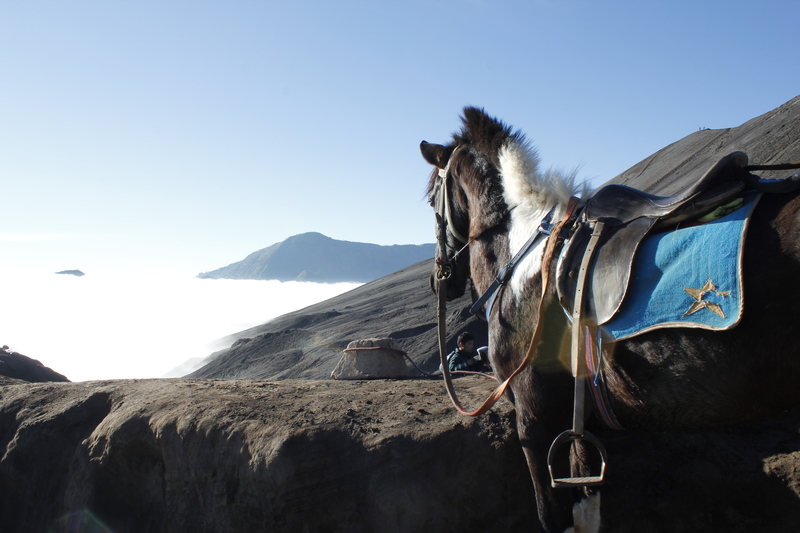 After the volcano I went back to the homestay to meet the driver that would take me back to the town of Probolingo to join the next group to go to Ijen, another volcano. We had breakfast at the warung (cafe) in front of the hostel where I met a fellow Colombian! what?! a Colombian traveling in Indonesia?! I don’t even meet Colombians in Los Angeles! It is always great to meet a Colombian anytime, anywhere but the cool part about this encounter is that we had a few things in common. First is that he is also traveling around the world (or at least Asia) without any preset plans, just like me. Second, he had been dreaming about this trip for the past 10 years, just like me. Third, he wants to experience the jungle and see some wildlife, just like me. Sooooo, we are meeting in Sumatra to go find us some jungle adventures. The drive from Probolingo down the mountain was absolutely breath-taking. We drove through the village of Ngadisari with tall lush mountains all around covered with huge plantations of carrots, green beans, potatoes, tomatoes and strawberries. The unfortunate part of the trip was hitting a motorcyclist who tried to pass our van on the left side as we were trying to make a left-hand turn. It was ugly and I thought for sure we had killed the guy but thankfully he just got a few scratches on his arm. The driver got out to check on the guy and ended up paying him Rp100,000, the equivalent of about US$7. The accident, from our perspective, was the motorcycle rider’s fault but the driver just wanted to get us back on the road again so he did what he had to do. The young rider happily accepted and they shook hands. 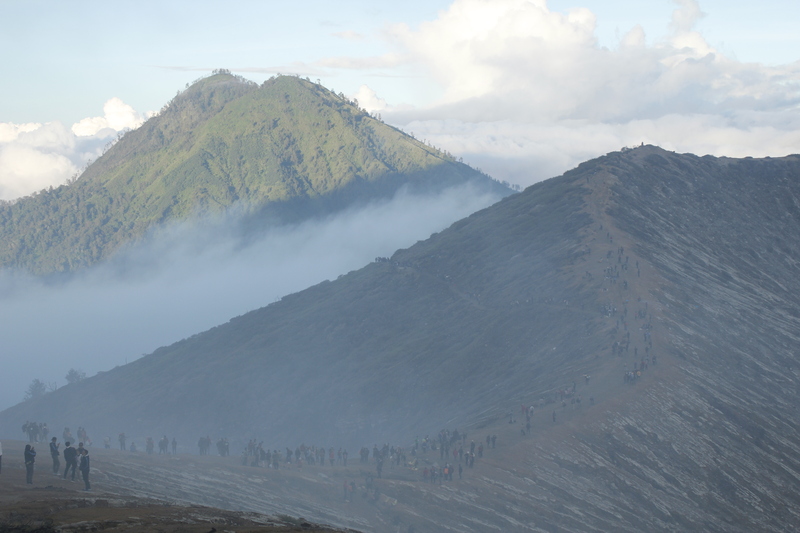 Our next trip that afternoon was another 5 hours by car to Sempol, a town near the Ijen plateau to go visit the Ijen volcano and hike down into its crater to see blue lava, all in the dark of course! We began our very steep 3 km (around 2 mi) or 1-hour hike up to the crater at 2:00 am. 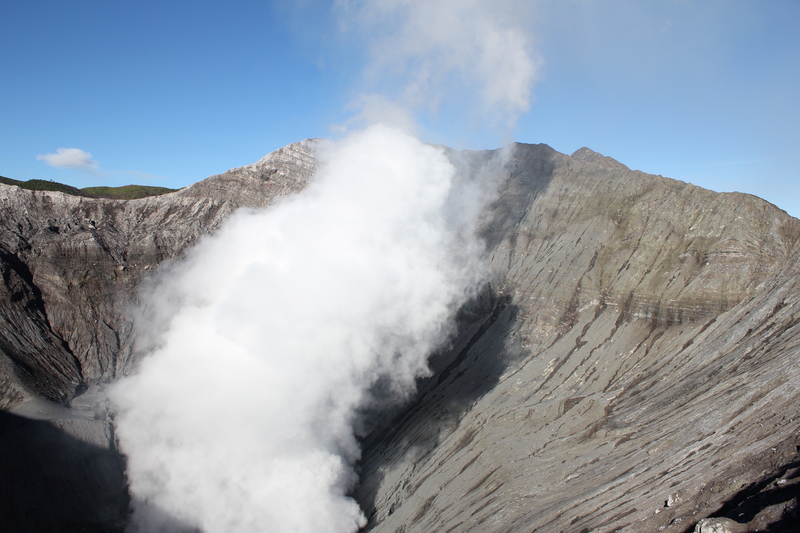 We then followed it with another very steep hike down into the crater to the sulphur deposits. For the walk down we had to wear masks to protect us from the strong fumes. Our eyes were burning and it was difficult to breathe, even with the mask. Seeing the blue flames in the crater and spotting a little bit of the blue lava was an unforgettable experience and well worth the suffering. 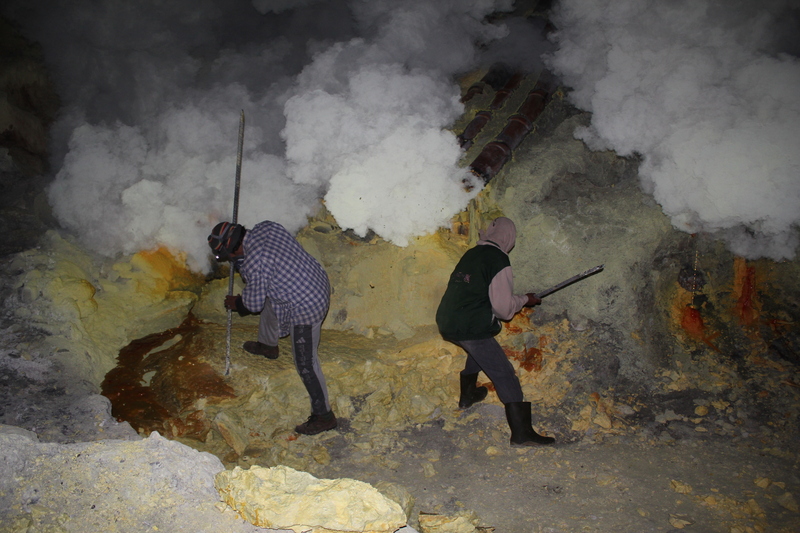 We ran into a few of the “sulphur men” that go into the crater, without masks, to hack out the sulphur by hand. 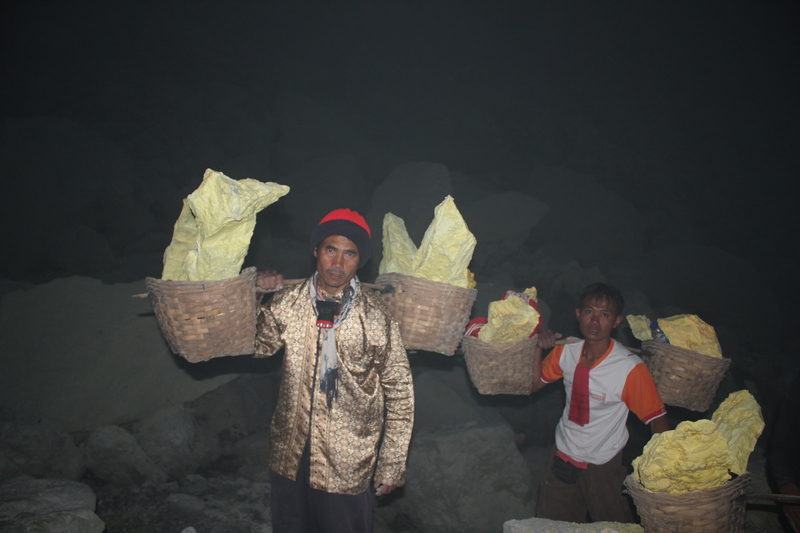 They carry 60 to 80kg (2.2lb/kg) of sulphur up the steep path and sell it for around Rp700 per kilo, making about $3 per load. The sulphur is used to make cosmetics, fertilizer, medicine and insecticides. Some of the pictures below are from one of these sulphur men that stopped to pose for us, wishing we would give him some money; which we did. He had a broken shoulder; which he proudly showed us as proof of his incredible strength. These men also make figurines with the sulphur to sell Seeing these men work so hard, in such dangerous conditions, for such little money is a real humbling experience. I will never complain about having a bad day in the office again! On the hike down I found a girl that I had met from San Francisco crying and asked her if she was ok. She explained that she was overwhelmed with emotions of how happy she felt in that place. It was all very beautiful and special for her, just like it was for me. I have felt exactly like her so many times on this trip already. I just feel so lucky to be realizing this dream of traveling long-term around the world and experiencing so many wonderful things. The outfitter booked my train ticket from the wrong origin so I had to endure another 5 hours of mini bus travel back to Probolingo where I caught the next train out to Yogyakarta (another 8 hours). This ride although long, was very pleasant. I had time to do lots of reading and listen to music. I met some nice people and everyone always wants to share their food.